The Samford University debate team of Hope Reamer (Birmingham, Alabama) and Jamie Davenport (Grovetown, Georgia) won the University of Kentucky Henry Clay Debate Tournament Oct. 1–3, defeating Wayne State University in the finals. The team amassed a winning preliminary record, defeating teams from Emory University, Michigan State University and Vanderbilt University before defeating Indiana University in the final four en route to the finals. Reamer was named Third Speaker and Davenport was named Fourth Speaker. The Samford teams of Niki Brooks (Alpharetta, Georgia) and Ashley Herring (Chattanooga, Tennessee), and Robbie Nikont (Lakewood, Colorado) and Moriah Windus (Ozark, Alabama) also competed, earning victories against Missouri State, Emory, Wayne State and Michigan State. Brooks was named Seventh Speaker. 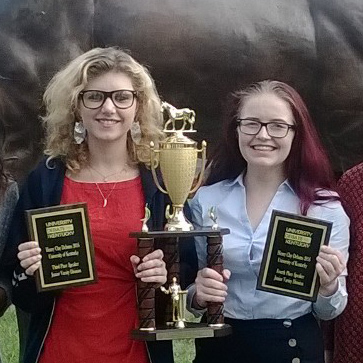 The debaters will next compete at Liberty University and Wake Forest University tournaments in November.